Who was the first country to sign the UN Charter? - Ask DAG! Who was the first country to sign the UN Charter? 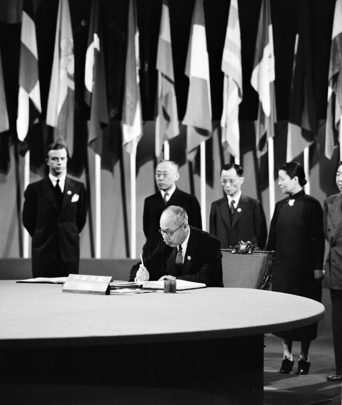 According to the UN Yearbook, 1946-1947, China was the first to sign the UN Charter. Page 33 para 15 of the UN Yearbook states: "...On the following day the signing ceremony took place in the Veterans War Memorial Building at San Francisco. China, in recognition of its long-standing fight against aggression, was accorded the honor of being the first to sign. It was arranged that the signatures of the U.S.S.R., the United Kingdom and France should follow, and then, in alphabetical order, the remaining nations, with the United States, as host country, signing last. As each delegation came forward to sign, its chairman made an official speech to commemorate his country's participation in the work of the Conference"
Further information about the UN Charter can be found in our Charter of the United Nations Research Guide.